Washingtonians are a hard working sort, 24/7 type of people. But when the elected officials on Capitol Hill leave town to return to their states/districts for the month of August (and one, maybe two depending on what Chamber you’re in) week(s) in September, a hush falls over the town from Capitol Hill to K Street. Sure, it can be great. The lights never get turned on in parts of the office, you can catch up on work, and relax for the first time all year. But this relaxation can get dull fast. So what’s a hard-worker to do in this painfully quiet time in Washington? Office Bowling: rolling chairs, rubber band balls, books and a bunch of interns with nothing to do? There’s a lot of potential there. Mess with other people’s things: people are gone. Sometimes for the whole month. 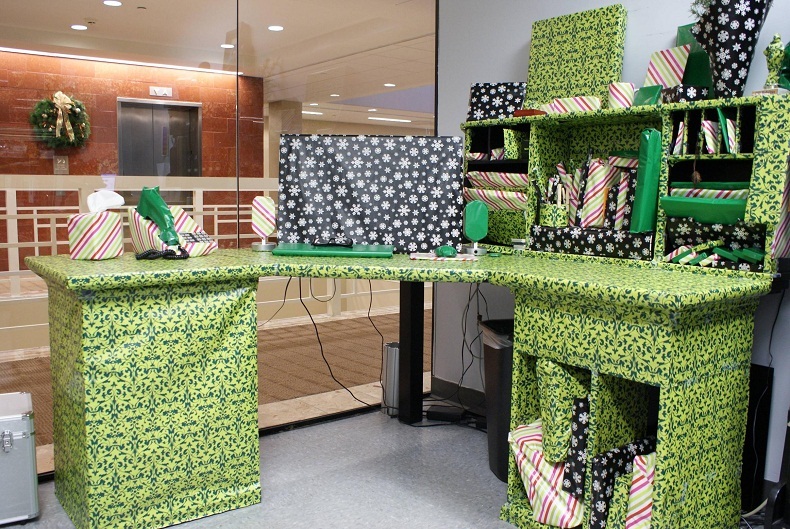 Why not gift wrap, saran wrap, or foil your neighbors cube as a “welcome back!” from their travels or stay-cations? So thoughtful. Reception Hopping: particularly those with free alcohol. It’s also possibly be your only chance to see other humans all day. But choose wisely. Play our “Intern Bingo” before they all leave: Get your card here! Clear your search history: maybe Pinterest and The Chive shouldn’t be your most-visited sites? Explore new happy hours: Dupont? Sure. Shaw? Eh, why not? Courthouse? What the hell. Shirlington? No. Have some respect. Running of the interns: some poor interns are still stuck here for the month of August, many of whom aren’t getting paid. Keep a scoreboard of the interns progress (or how fast they do the same job). Each staffer gets an intern. Best intern wins. Cubicle workout: supposedly there are workouts you can do at your desk. Maybe now is the time to start? Clean your desk: Those cans of compressed air can work wonders for your desk. But don’t look at that Clorox wipe after going over your keyboard. you don’t want to know. Answer the phones at your front desk: if this isn’t already your job, how about a #tbt? And some humble pie. …but keep it classy when dealing with constituents. Get creative on your lunch break: you know, maybe try eating off campus. Or bring a fun DIY lunch! Or just take a three hour lunch downtown with some lobbyists. Rubber band balls: seriously, so much potential for activities.